"I think I've achieved more in the last 20 or so years by knowing him...and it's given me a chance to reach deeper inside myself..."
Bruce Lee is the undying spirit of filmdom's martial arts genre, which is ironic considering he's far from being its first true figure. Still, his charisma and talent have won him an eternal place in film history, despite his tragically early death that left an incomplete career as his legacy. 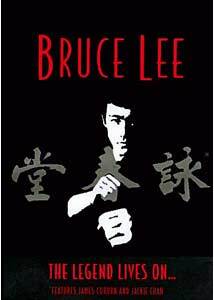 At the same time, though, Bruce also sought to bring about a new kind of consciousness about martial arts by creating his own, teachable, freeform style of kung-fu called Jeet-Kun-Do. Since his death, his life story has been of endless fascination to the public, especially since it is often mixed with all sorts of mysticism about his death being "destined" by a curse on his family, especially with the death of his son Brandon (despite the fact he's survived by a wife, a daughter, a brother, and many others). The questionably-accurate motion picture, Dragon, told Lee's story in a very theatrical way, but this disc, simply titled The Legend Lives On, opts instead to let those who knew Bruce tell his story. There's no narration; just his family and friends discussing everything that made Bruce Lee who he was. Bruce Lee's life growing up in Hong Kong (after being born in America) is portrayed by his family and friends as being somewhat awkward. His talent at kung-fu was quite impressive, but as a result, it got him into a variety of brawls that made him a controversial figure in his neighborhood. In order to keep him out of trouble, his family sent him to the United States where, stirring up even more controversy, he would attempt to found a kung-fu school of his own using his own ideals and teaching methods. This was controversial because in the world of martial arts, it's generally considered disrespectful to create a martial arts school without the permission of those who have either taught you or founded the fighting style before you came along. Still, Lee was successful at what he did, and even earned many celebrity clients along the way such as James Coburn and Steve McQueen. Lee ultimately wanted a show business career and, as many are aware, he was extremely close to being placed in the television show Kung Fu, which was inspired by one of his own ideas. However, after being rejected from involvement from that project and then finding that his work on The Green Hornet was not really going anywhere (despite good critical reaction), he went back to Hong Kong hoping to make it big there. Although Hong Kong was already establishing itself as the core of the kung-fu film market, Lee's interesting ideas on not only brutal action sequences, but the construction of very endearing, exciting storylines, was what ultimately brought the audiences into the theaters. The documentary does a good job at capturing exactly what it is that made Lee so special to those who knew him; because of his freight-train-like enthusiasm for taking things further and faster. Although he was an extremely hard person to work with simply because of his relentless perfection and over-planning, there's no one interviewed here who has a negative thing to say about Lee, except that maybe he worked himself too hard. While there are some people who don't appear in the program (for example, I don't recall an appearance by Lee's widow), it still is very complete and well defined, thanks to the presence of people who really had deep involvements with him. There's even some brief thoughts from Jackie Chan, which is interesting as Bruce Lee "inducted" the next generation of Hong Kong stars by not only beating up Chan (in stunts, of course), but also placing a few kicks into Samo Hung and Yuen Wah during his film career. Overall, The Legend Lives On is a very entertaining and effective look at Lee's life from those who are in the best position to say anything. There's been many documentaries about the man, but I think this one fits in nicely, despite not being as flashy and highly produced as some of the others. Image Transfer Review: I'm reminded of another Waterfall disc I reviewed, The Doctors, because this one shares many of the same problems. The video is greatly effected by serious scanlines and artifacts that seem to be a result of not only the format (it looks to be relatively basic home video with no special additional lenses or film types) but the transfer. As with The Doctors, there's a lot of text that simply isn't on the screen, but rather pushed off the bottom. Now, granted, my television isn't perfect and has some geometry problems, but certainly nothing that would push 2 inches of text off the screen. Exactly why the film looks like this is not quite clear, although it might possibly be the result of not properly framing the picture. The film clips used in the documentary are also not in the best condition, but that, in and of itself, is no big deal. Audio Transfer Review: The mono audio serves the film well, but obviously not exotic. The interviews are relatively easy to understand and there's no major distortions, it just isn't anything special. Extras Review: The disc contains no supplemental material at all; in fact, it doesn't even have a menu. The movie just plays and while it does have a good division of chapter stops, there is no chapter menu. Accessing the menu simply brings up a looping 'screen-saver' type image of Bruce Lee, and nothing else. This is nothing terrible, but might confuse people a little who expect at least a chapter menu. In a way, I preferred this documentary over the also new Bruce Lee biography produced by American Movie Classics. While that program features the newly uncovered and restored, full-length uncut final reel of Game of Death (Lee's final film, only about 20% of which he actually stars in due to his unexpected death), this one has a kind of simple, earnest manner that makes it more involving and less about production values and presentation. Any Bruce Lee fan should definitely give this a look for a slightly different look at his life as it is viewed through those who actually worked and lived with him.